With the Outdoor Retail Show in Utah just over, and the ISPO in Munich in full swing, I'd say we lightweight and UL backpackers should look to the true innovators not attending these shows - the cottage manufacturers who produce since years real ultralight and lightweight gear for our needs. Consider this a current report on new gear from cottages the world around! The new Katabatic Gear Blackwelder quilt. Katabatic Gear came out with two new quilts, the Blackwelder 0°F, a serious winter quilt filled with 610 g of down for a total weight of 935 g; and the Alsek 22°F for the warmer summer months months. My me, that looks so cozy warm that I wanna go sleep in it! enLIGHTened equipment is on a break at the moment, developing new gear. They should be back in business in a while, so don't worry! The New SMD Skyscape shelter. Six Moon Designs announced the new Skyscape shelter which will become available this coming spring. Ron is also working on a smaller sized pack which he will announce in a couple of weeks, and the Haven is undergoing a re-design. Finally, with the release of Skyscape, the Vamp will be discontinued. Ron says it's too costly to make and difficult to setup correctly, and that the closeout sale will probably be next month. Jacks 'R' Better now offer 900 fp down as a filling for all their quilts. All quilts with 900 fp are a tad lighter than before, with the same performance. JRB also brings out three new hex tarps and a new summer quilt, and they will debute at Trail Days in Damascus Virginia the second week of May. Furthermore, in case you missed it, last autumn the worlds flattest hammock, the JRB Bear Mountain Bridge Hammock, got a makeover and now comes with an attached bug net with three sidezippers so that it can be completely rolled back and tied out of the way when not in use. Fritz from Bushbuddy has been kept busy by making the normal and Ultra BushBuddies, and hasn't had time to work on new projects, though they're still on his mind. So those that want to see a Ti BushBuddy should practice themselves in patience. Trail Designs has currently a lot to do as their new website created a lot of demand for the products. New gear might appear during the year, so keep an eye on their site. Gossamer Gear came out with the CubicTwinn Tarp a few weeks ago, the popular SpinnTwinn made even lighter. The Lodge should also make an appearance in the next months on their website, so check "The Week In Review" when the info is out, or keep an eye on the GG website. AntiGravity Gear has a number of new products in development, and George disclosed that they're working on a new alcohol stove based on their Tin Man BCS2 stove - this should be ready in a couple of weeks so keep an eye on their website if you're in the market for a new stove. Titanium Goat is cooperating with a few other cottages to offer some interesting new products, such as the Sierra Sniveller Special and Cyanocitta quilts. In-house they continue to make excellent lightweight gear, with the new additions to the family being the Raven Omni bivy, carbon fibre lids and tent poles. Goosefeet, made by Ben Smith, are also available through them. Hmm. Goosefeet. Warm. 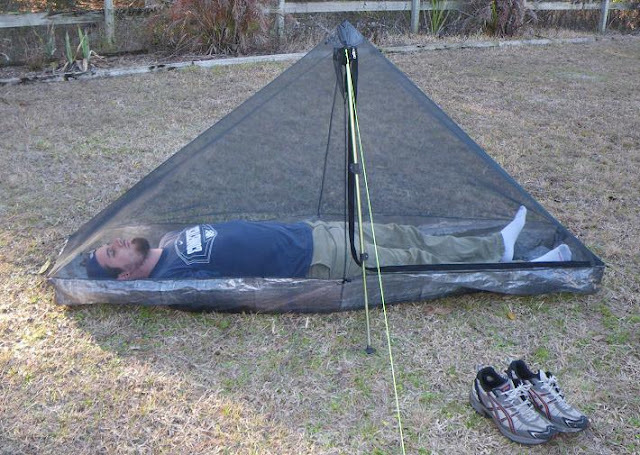 Alpinlite Gear has no new products to announce for 2011, but in late 2010 Gen released the Terraform tarp and Bug Shelter 2.0. In a few weeks he will be releasing a small version of the Terraform tarp sized to fit the Bug Shelter 1.25 (so a new product after all =). Hyperlite Mountain Gear has updated their Windrider packs with wider hip pads and larger hip pad pockets, an increase in volume of the back mesh pockets, a switch to a lighter, stronger aluminum stay, an added hydration sleeve to the inside of the pack, and a new size for a total of 4 sizes, S, M, L and L-tall. HMG also added an ice axe loop and keeper & an additional compression strap to the bottom of the pack. Puh, that's quite an update! Two different packs are in development and will be launched during this spring as well, fleshing out their line. Another interesting development from HMG is a cuben ground cloth which can double as a tarp and a hex cut hammock tarp should also be coming soon. The Echo shelters will get an increase in headroom for the inners, and finally, Hyperlite Mountain Gear will soon offer COLOURS! Warbonnet Outdoors likes to shred itself in mystery and keeps its cards close to its chest. What Brandon was willing to tell me was that there's a few new products coming out in the months to come. We shall wait and see. Pokerface. 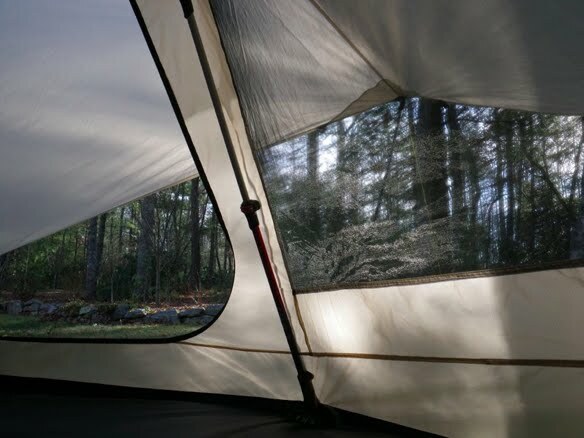 A look out of the new LightHeart Gear Awning Tent. LightHeart Gear introduced a few weeks ago the Solo Awning Tent, and it isn't yet certain if it will be available with one door or two or have options on these. Still coming is "The Wedge", which will allow existing solo and duo tents to be set up as an awning tent. Mountain Laurel Designs just announced the 2011 version of the Alpine bivy, now called eVent Soul Bivy and it sports a cuben floor. 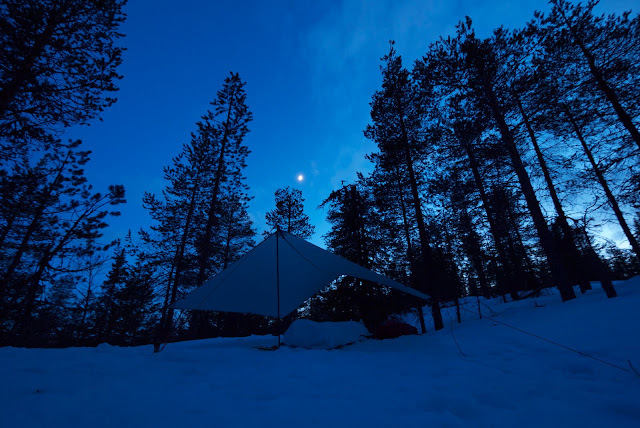 And in January MLD announced the Cirrus tent, a four to eight person single-wall shelter. 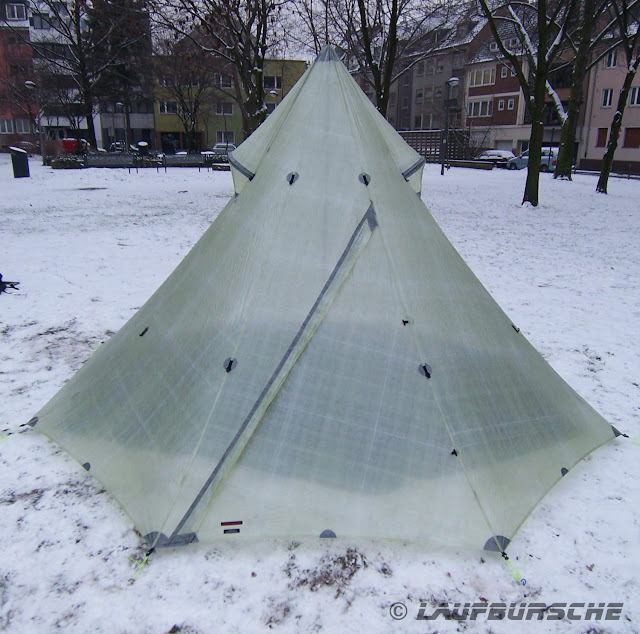 Additionally Ron let me know that they will have Cuben LW packs back soon, and a new, lighter series of Cuben fiber tarps and shelters, made from lighter Cuben, the AIR SERIES. They also started makings quilts again and some other gear with the new Momentum 5o, a 10d fabric. ULA Equipment will have some slight changes in future Circuit and Catalyst packs (see on the ULA Facebook wall) and all other packs stay the same. The Epic now includes a 55 l Drybag and sports an interchangable hipbelt. Elemental Horizons came out with a new pack, the Aquilo. It is a lightweight frameless pack that weighs about 709 gram and is designed to use your sleeping pad as the support system inside the pack, and it is also compatible with the aluminum stay from the EH internal frame pack, the Northern Lite. They're available in Medium and Large Size with a volume of 42 liter. Matthew also is working on another pack, about which we might hear more in the future! LAUFBURSCHE from Germany sets the bar high for Laavus & Tipis with his newest creation. At an height of 195 cm, a diameter of 330 cm and a trail weight of 500 gram we have a serious contender for the title of "Lightest Tipi Shelter". 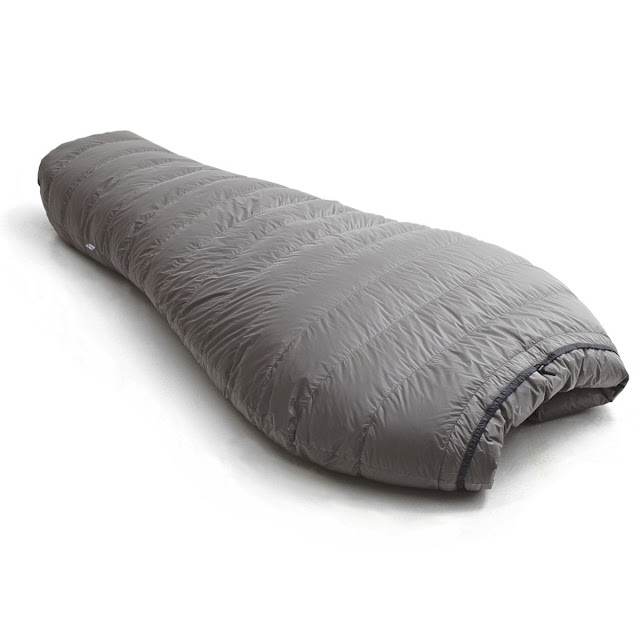 The material is cuben, and my Samurai heart skipped a beat as I heard it also will be available in black. You can get various groundsheets and inners for it, suiting any condition. He's also working on expanding his backpack offerings, and, most importantly, hopes to have his Webshop online soonish, to be found under http://www.laufbursche-gear.de/. Mountainfitter brought out some nifty small pieces of gear which usually are overlooked but are essential for an UL backpacker. Their titanium stake which is called the Ti-eye and is designed to replace the titanium shepards hook; it is currently offered as a 5", 6" and 8" version. Lawson will also soon offer a 6.5" long, 13 gram headless Titanium nail stake called the Ti-spike, made from a piece of 6AL-4V 4.75mm rod which has a hole drilled in it and comes with some of his guywire 100% dyneema cord. Speaking of cord, a 2mm solid braid 100% dyneema cord rated to 850lbs is also new; the solid braid holds knots better which is a real plus with the slippery dyneema. You also might want to take a look at the bear bag system he offers, which is the lightest in the world. Finally, also new is the "Tarmock", a silnylon hammock tarp hybrid weighing in at a mere 369 gram including a stuff sack and two CAMP carabiners, and for which an optional setup kit will be available. The new HexaNet Solo Bug shelter. ZPacks also will come out with a bunch of new gear, including waterproof breathable jackets, a non-breathable rain cape to go with their cloud kilts, an inner bug net ("HexaNet") for the Hexamid tarps, a vapor barrier liner quilt, a hammocks and hammock shelters and several miscellaneous accessory projects. All that and some new weights of cuben fiber material and new colors are also coming. On a side note in that matter, ZPacks is working together with TrailLite Designs to make available the cuben CloudKilt and CloudCape, and a cuben UL Ebira tenkara rod carrier. Locus Gear from Japan also has some new gear coming out. First, we'll see eVent, Pertex and a secret ultra light breathable fabric being used in future creations. Second, Jotaro works on a limited edition of a tipi shaped shelter set which includes a inner mesh and bathtub floor shelter, pole and stakes. A new, green-ish color SilNylon for the Khufu and Khafra series will be coming this spring, making those shelters very stealthy. There's more in the pipeline, so keep your eyes and ears open! Finally, Henry Shires from Tarptent has been busy working on their office expansion, so product design has been on hold for a while and we likely won't see anything new before the autumn from him. However, a new website including setup videos should be online soon, so you might want to regularly surf to Tarptent to check it out. I contacted Aarn from Aarn Design, Don from Four Dog Stoves, as well as CRUX and Lightwave if they have any news, but there came no reply. I hope you enjoyed this run-down of new gear from our beloved cottage manufacturers. In case I missed something, please leave a comment and I will amend the post!